Save big on Coleman camping gear, a portable projector, a trash can that isn’t garbage, and a whole lot more. Today only, the Capsule is marked down to $248 on Amazon as part of a Gold Box deal, which is about $100 less than usual, and the best price we’ve seen since it was up for preorder on Indiegogo. Here’s a USB charger without compromises. It’s small and includes folding prongs, making it ideal for travel. And yet, it squeezes in four ports, including one with Quick Charge 3.0. That means you can fast-charge your phone, while also juicing up your tablet, Bluetooth headphones, and smart watch while you’re on the road. $22 is $6 less than usual. If you own external monitors and they can be VESA mounted, there’s really no reason not to. It raises them to an ergonomic height, gives you lots of positioning options, and most importantly, clears up some valuable real estate on your desk. This mount can hold two screens up to 32" each, and it’s just $25 today with promo code PKJKYKHF. Anker’s recently broke out all of their audio products into a new SoundCore band, and they marked the launch by releasing their first ever over-ear headphones. The Soundcore by Anker Vortex features 40mm drivers, a 20 hour battery, and the ability to plug in an AUX cable and use them in wired mode if you forgot to charge them. They also fold up for easy transport in your bag, and of course, come with Anker’s hassle-free 18 month warranty. For a limited time, you can save $20 off the launch price of $70, no code required. Just in time for beach season, Amazon’s running a one-day sale on a couple of umbrellas and beach chairs from Ostrich and California Umbrella. The umbrellas include three-way tilting, so you can throw shade at the perfect angle, while the Deluxe beach chair includes five chair positions and three foot rest positions. Update: Zwilling is excluded from the sale, so the promo code won’t work on the pans, sorry! Today and tomorrow only, Food52 is running one of its only sitewide sales of the year, taking 15% off any $125+ order with promo code WARMINGUP. There’s a lot to sort through here, but we recommend starting your search with Zwilling’s Carrara Pans, which we love. The three-pan combo pack comes out to about $118 with the promo code, which is a steal for these rarely-discounted skillets. Have any other recommendations? Drop them in the comments below. You all know this, but replacing your air filters is one of the cheapest ways to improve the air quality in your home. They can remove funky smells and allergens and, especially important this time of year, make your AC unit more efficient. Home Depot is selling a whole bunch of 4-packs of Arm & Hammer air filters for just $20 today. So go ahead and stock up. If you’ve never deep-cleaned a carpet, get ready for an eyeopening experience when you see just how much crap a person can track into a home. At $80, this discounted BISSELL PowerLifter is perfect for keeping your carpets actually clean as opposed to just looking clean. If you have trouble unwinding and turning off your brain at the end of the day, you’re gonna want to check out a weighted blanket. We’ve seen a lot of deals on 15 pound blankets lately, but today, ANJEE has not just a 15lb blanket, but a 20 pounder on sale as well. The 15lb is $110, but you can upgrade to five more pounds of relaxation for $128. Just make sure you pay attention to the right promo code. Like the outlet timer people use for their holiday lights, this Orbit programmable hose timer turns on and off based on the schedule you set. It’s especially helpful if your area has drought restrictions, so you can program it to water your lawn or garden during your designated times. $19 is the lowest Amazon price we’ve ever seen, down from the usual $25. It’s part of a larger Amazon Gold Box, which also includes a motion-detecting sprinkler to deter animals from eating your plants and an Alexa-enabled sprinkler system controller. 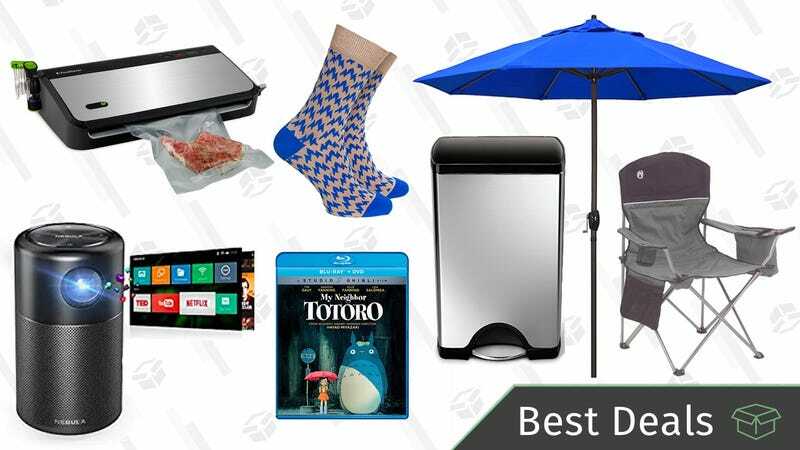 These deals will only last until the end of the day or until the products sell out, so don’t wait for these deals to dry up. The true summer months are fast approaching. If you have a camping trip planned and need to replace some gear that’s maybe past its expiration date, this Coleman Gold Box is for you. Tents, sleeping bags, coolers, air mattresses and more are discounted, with everything coming in under $100 (even this 8-person tent). Just because you’re dressing up doesn’t mean you can’t have a little fun with your socks. For a limited time, choose any of the Barons Sock Club styles on this page, and you should see a 20% coupon on the product page that brings them down to about $10. Personally, I’m into the Blue Wave pattern. Our readers have bought a ton (actually several hundred tons) of adjustable dumbbells over the years, but now you can enjoy the same space-saving features in a kettlebell. The PowerBlock KettleBlock is available in both 20 and 40 pound varieties, both of which allow you to change the weight as you change your workout, and add a few pounds as a you get stronger over time. The best part, of course, is that they replace an entire set of kettlebells, and barely take up any space, so you can stick yours in the corner of your closet without turning an entire room into a home gym. Woot’s $75 deal on the 20 pound model and $150 price on the 40 pounder are both the best prices we’ve seen. Just note that both are only available today, or until sold out. You don’t need waterfront property to enjoy a kayak. You don’t need a roof rack. Hell, you don’t even need a lot of space in your home to store one. This inflatable two-seater from Intex only weighs about 30 pounds deflated, so you can throw it in your trunk, and blow it up once you get to the water. $59 is the best price ever, and it even includes two oars and an air pump. But this deal is only available today, or until sold out. Timbuk2 is best known for its excellent messenger bags, but they also make some of our readers’ favorite rolling suitcases. Luckily, both are included in this limited time Amazon sale. If you need anything for the outdoors, Backcountry has it on sale. Take up to 50% off items from brands like Patagonia, Marmot, Black Diamond, and Mammut. Plus, grab 30% off one full-price Arc’teryx item as well.